In December 2012, ASLM launched its new Collaborating Centres programme, which aims to strengthen laboratory networks and standardise diagnostic services across Africa. The programme provides a platform for Collaborating Centres to foster laboratory linkages, evaluate new technologies, and adopt high-efficiency operating models to improve diagnostic testing. ASLM recently spoke with Dr. Clement Zeh of the Kenya Medical Research Institute (KEMRI), one of ASLM’s Collaborating Centres, about the organisation’s history and activities. Dr. Zeh serves as Acting Branch Chief for the KEMRI HIV Research branch, as Director of KEMRI’s HIV research laboratory in Kisumu, and as principal investigator for the KEMRI/ASLM collaboration. KEMRI is an organisation of the Ministry of Health of Kenya, and the national body responsible for carrying out health research in Kenya. Established in 1979 with a mandate to conduct research on the major public health challenges of the country, KEMRI has collaborated on research with international institutions (US Centers for Disease Control and Prevention [CDC], the Oxford/Wellcome Trust of the UK, the Japan International Cooperation Agency [JICA], the Walter Reed Project of the US Military) as well as local institutions and universities. KEMRI comprises 10 research centres, including the Centre for Global Health Research (CGHR) in Kisumu, western Kenya. Since its establishment in 1984, CGHR has conducted ground-breaking research with a focus on infectious diseases of public health importance. “Initially, the focal point of KEMRI’s research activities was malaria,” says Dr. Zeh. However, KEMRI’s activities have evolved to include research on HIV, tuberculosis, emerging and neglected diseases such as schistosomiasis and helminthiasis, and the role of demographic surveillance systems to assess health needs. Other key research areas include drug efficacy, emerging drug and vector resistance, epidemiology, immunology, molecular and vector biology, environmental and human health, HIV co-infection, and reproductive health. KEMRI has attained International Organization of Standards (ISO) 9001:2008 accreditation in recognition of its high-quality research portfolio. In addition, both the HIV and TB laboratories within CGHR have ISO 15189 accreditation. 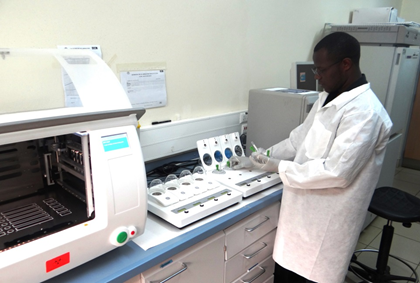 The HIV research laboratory is one of the major laboratories under the KEMRI and CDC collaboration. KEMRI’s HIV research laboratory has also recently taken a role in implementing a document and quality management system, paperless documentation developed by SoftTech Health, and a Six Sigma metrics analysis approach. Six Sigma is a process quality metric that provides a framework for assessing variability in analytical processes and fostering greater uniformity in the application of statistical methods, which enables the HIV research laboratory to improve its practices. KEMRI became an ASLM Collaborating Centre in 2013, through its HIV research laboratory, following performance evaluations of the laboratory. The evaluations consisted of assessments of the Centre’s reputation and work in research, policy making, training, and technology assessment and implementation, amongst other areas. Strengthening of African laboratory workforce development as part of the commitment to achieve Unite Nations Millennium Development Goals for health through targeted training programmes. Participating in regional regulatory harmonisation of diagnostics. Through the evaluation of new technologies, KEMRI produces high-quality data for national and regional regulatory review. Furthermore, KEMRI facilitates the development of regulatory policy, protocols, standard operating procedures and guidance documents. Supporting laboratory accreditation initiatives at the regional and national levels to transform the quality of diagnostic services through the expansion and implementation of the World Health Organization Regional Office for Africa (WHO-AFRO) Stepwise Laboratory Improvement Process Towards Accreditation (SLIPTA). Promoting skills transfer and capacity-building among laboratory scientists. KEMRI participates in South-South collaboration, hosting representatives from laboratories in various African countries and sending key staff to on-site trainings on laboratory techniques and quality strengthening. Fostering the establishment of a network of national public health reference laboratories by playing a key role in training, quality assurance and laboratory capacity-building in the healthcare system. Going forward, Dr. Zeh hopes that KEMRI and ASLM further expand their collaboration to maximise the impact of medical laboratory and health improvement efforts across the continent. By pooling resources and exchanging expertise, says Dr. Zeh, the Collaborating Centres programme can expand activities to include joint trainings and publications, in addition to other capacity-building activities in laboratory medicine. To learn more about ASLM’s network of Collaborating Centres: www.aslm.org/collabcentres.